i've been wearing the A.P.C.s about 5 days a week since my last post. it has now been a month and a week. breaking-in update: the jeans have softened up a lot. the creasing and whiskering at the waist/hip area have definitely settled in, and there are some nice honeycombs that have formed behind the knees. i haven't hemmed these and don't see the need to until at least the first wash, as the petit new standards have a shorter inseam than the other styles. comfort rating: we're at a 4*: softened-up with just a hint of stiffness remaining, comfy personalized fit overall. fit: the waist, hip, and knee areas have loosened up a bit since the snug, stiff fit of the first week. however, as you can see from the photos, the jeans have still retained a slim-straight fit, and the waist has not stretched out nearly to the point where i'd need a belt. as of the 1 month mark, the jeans really do fit like they have molded to my frame. as discussed in my original review, i don't think these will stretch out a full 2 sizes as typically described for guys (makes sense, as we have different waist-to-hip ratios and the same pair of jeans will inevitably fit differently). i definitely feel like i bought the right size. other thoughts: the non-stretch selvedge denim is a revelation after so many years of thin stretch denim. i really like how the the midweight cotton retains a certain 'structure' even as it softens up. if you're wearing a pair of raw denim (A.P.C. or another brand), how's the breaking-in going? I've bought the exact same pair about a week and a half ago... I've been wearing them daily and I feel them getting more comfortable every day, and yet they are by far the most rigid pair of jeans I own and I'm guessing they will stay like that for a long time to come. I'll do a post on them soon on my blog! Love to read more on your APC project! Ooh, so exciting! I can't wait to see how things develop! So far, they look wonderful, but I know they're just gonna get better and better and I anxiously await the passing of time so I can enjoy them vicariously through you! haha love your comfort scale. it looks good. well it makes you look good. 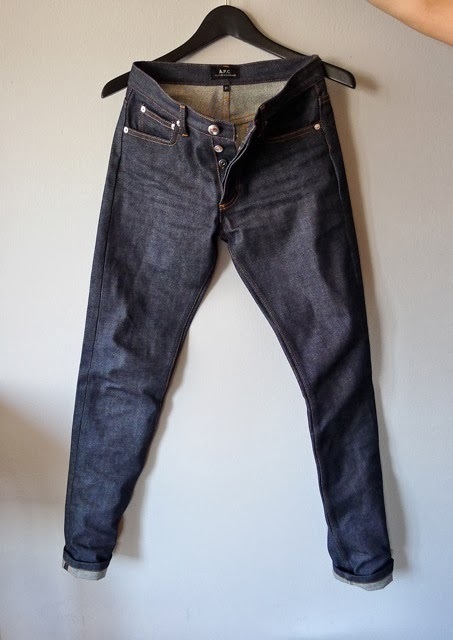 im looking forward to getting a pair of naked and famous denim soon (hopefully one day). My favourite thing about these has to the rise - quite hard to find a pair of jeans that sit higher on the waist without being high-waisted! I think jeggings killed the real skinny jeans. My first pair of skinnys from H&M were made of decent-weight denim that was slightly stretchy - but all the new skinnys these days seem to be made of elastic. Lin has a point about the rise of the jeans - they seem to be the perfect rise - not high which can look a bit mumsy sometimes but low enough to still give that edge. That's what I struggle with (unconsciously) with a lot of the denim styles out there at the moment. But please keep up the diary - it's a subject which fascinates me and one which I would fail at the first hurdle i.e constant wearing of the same pair of jeans day in, day out. But I'm sure I will be kicking myself for not going there after seeing yours achieve it's genuine creases and that holy grail softness. just stumbled on your blog and this project doing some research about finally washing my a.p.c. petit standards. i'm a bit over two years into mine and they've evolved into my only pair of jeans - though there have been stretches of time when i couldn't wear them due to the inevitable weight fluctuations, etc. that seem to creep up. 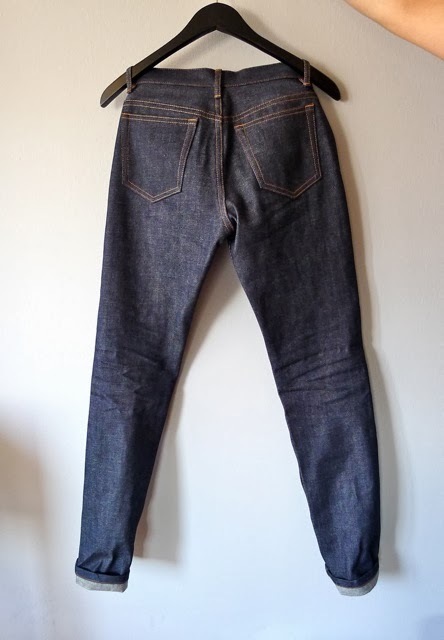 your posts have me thinking that the petit new standard might be my next pair of jeans, as my main complaint with my current pair is the lower rise. looking forward to seeing how your pair evolves! Hi, i am so glad to run into this post and all its comments. I just bought a pair of raw APC, after wearing it for a little while at home, i seriously thought about returning them. they do look awsome but they feel so uncomfy in comparison to my beloved boyfriend jeans. i like this concept of making your own pair of jeans, by breaking them.